During our many years in business, we have developed a reputation for pairing our premium products with five-star customer service. Our goal is to exceed our customers’ expectations, which we do by responding to clients promptly, showing up on time for appointments, and living up to all the promises we make. When you partner with Clemens Home Solutions, you can rest assured that highly skilled and professional installers will take care of the entire installation for you. Whether you are in need of a new gutter system or require an entire roof replacement, we are the home improvement contractor to turn to in Indiana. What’s more, we are so confident in the projects we complete that we back our labor with The Clemens Guarantee, which is our outstanding 15-year, full-service workmanship warranty. 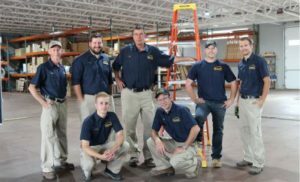 Are you ready to learn more about why we are considered to be Indiana’s go-to home improvement contractor? If so, contact Clemens Home Solutions today. When you do, we’ll be happy to answer any questions you have and speak with you about the excellent financing options we offer to qualified homeowners.